Trans fat is the common name for unsaturated fat with trans-isomer fatty acid(s). Trans fats may be monounsaturated or polyunsaturated but never saturated. Trans fats are usually hydrogenated fats. They are made by adding hydrogen to liquid vegetable oil under pressure. This results in a stiffer fat, a fat which is hard at room temperature. Trans fats occur naturally to a limited extent in the milk and body fat of ruminants (such as cattle and sheep). Unlike other dietary fats, trans fats are not essential, and they do not promote good health. The consumption of trans fats increases the risk of coronary heart disease by raising levels of "bad" LDL cholesterol and lowering levels of "good" HDL cholesterol. Trans fats from partially hydrogenated oils are more harmful than naturally occurring oils. Trans fats are harmful to children also. The exact biochemical methods by which trans fats produce specific health problems are a topic of continuing research. 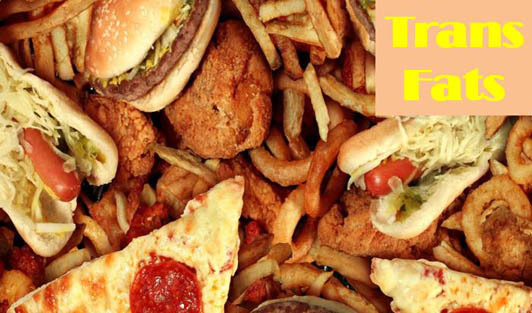 Trans fats are found in cookies and biscuits, chocolate, some varieties of breads, confectionaries, fast-foods, fried food items including namkeens, fried sweets, fried chicken, crackers, french fries, doughnuts, potato chips, many cakes and pastries, ready to eat meals, snacks and much of the street, restaurant and hotel food. Animal-based fats were once the only trans fats consumed, but by far the largest amount of trans fat consumed today is created by the processed food industry as a result of partially hydrogenating unsaturated plant fats (generally vegetable oils). These partially-hydrogenated fats have displaced natural solid fats and liquid oils in many areas, notably in the fast food, snack food, fried food and baked foods industries. Always read the Nutrition label on foods you buy at the store and, when eating out, ask what kind of oil foods are cooked in. Replace the trans fats in your diet with monounsaturated or polyunsaturated fats.